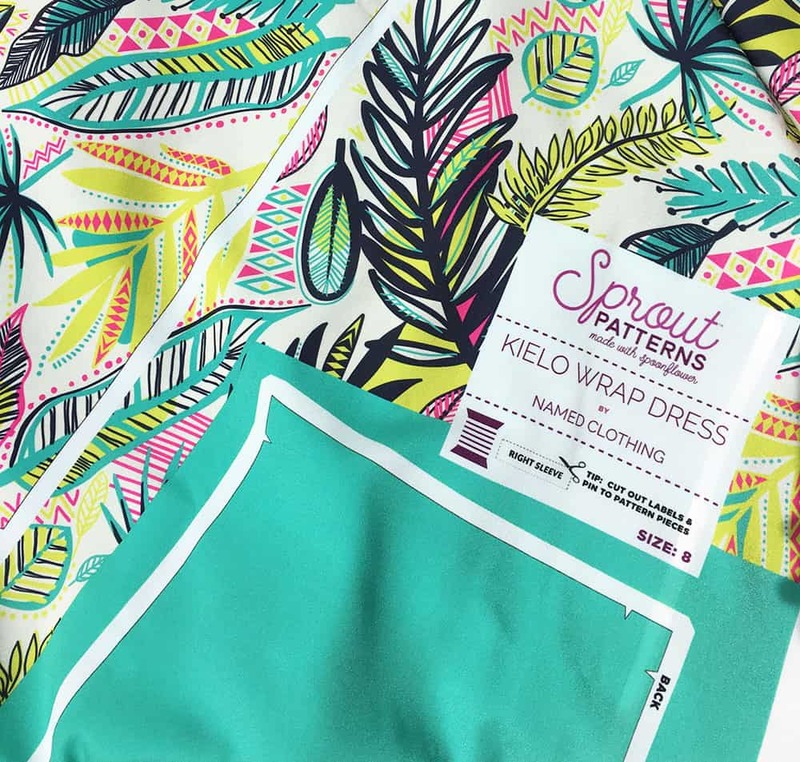 Meredith : Last year I decided to give my try at the Kielo Wrap dress by Named Clothing. After seeing it on Sprout Patterns, I quickly fell in love with the wrap style and versatility of dressing it up or down. 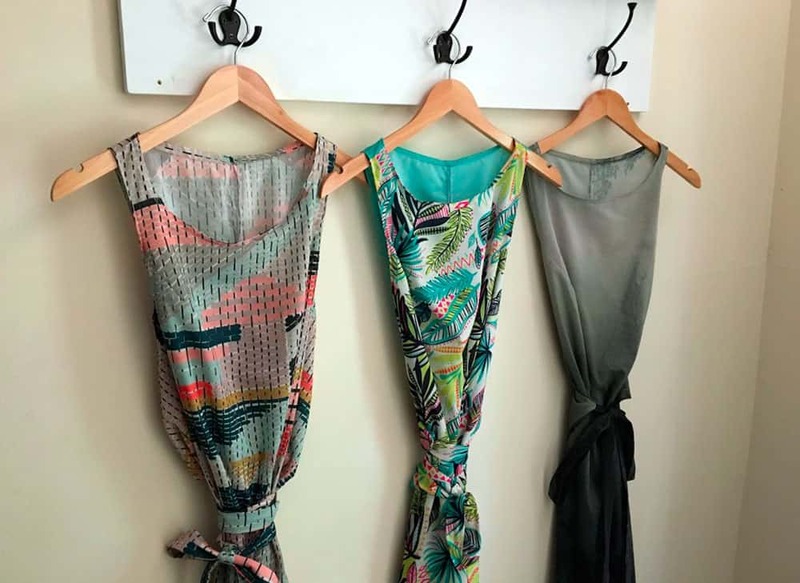 Within six months of first laying eyes on the dress, I had three new Kielos proudly hanging in my closet and knew there was no end in sight! During my lunch breaks and late at night, I found myself playing around with different pattern options just to see what they looked like on the 3D preview. This is such a great feature that’s available for each pattern on Sprout. Want to see for yourself? Take a look at all of the Kielo projects our community has created! 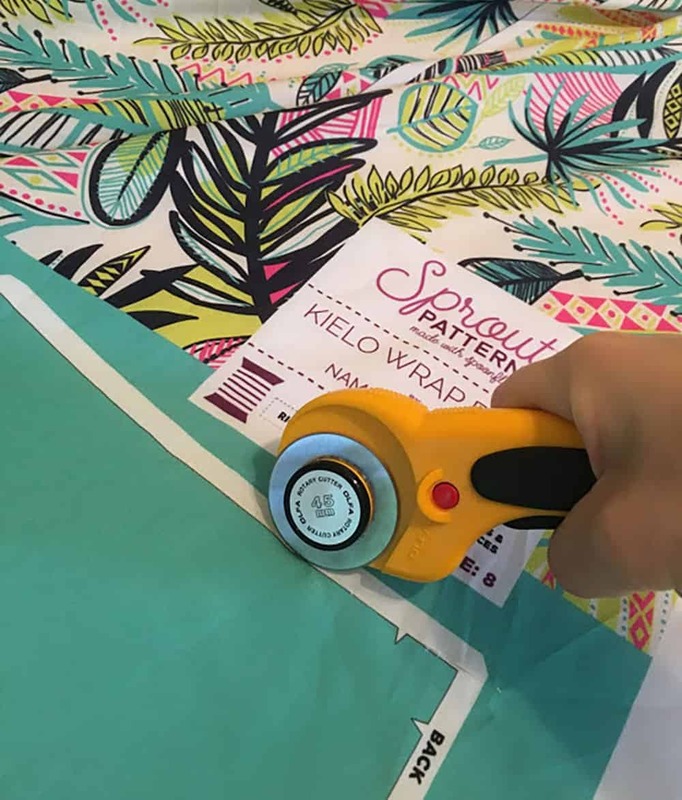 This month, I’m looking forward to attending the Mimi G Sewing and Style Conference (let us know if you’ll be there too by commenting below) with some of our friends at Sprout Patterns. 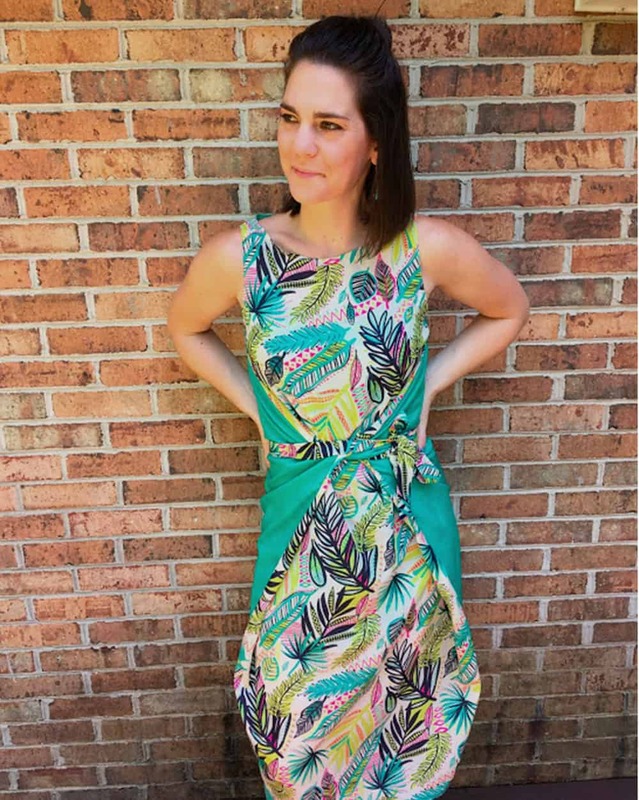 I knew I couldn’t attend the conference without a tropical outfit to match the luau-inspired theme, and my thoughts went straight to the Kielo Wrap dress (surprise, surprise!). 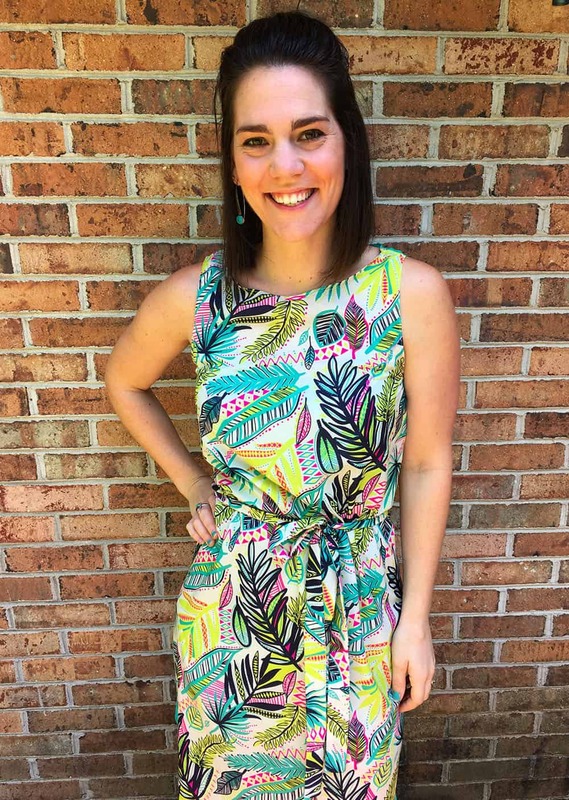 After doing a bit of searching in the Marketplace, I landed on the gorgeous “tribal jungle aloha” by Laura_May_Designs printed on Poly Crepe de Chine. Love those pastel colors! 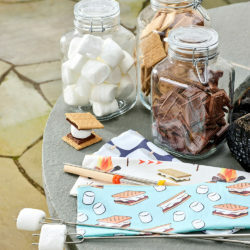 If you need a little luau inspiration, be sure check out this collection curated by Nicole, Sprout Patterns’ head of product development. It’s perfection. 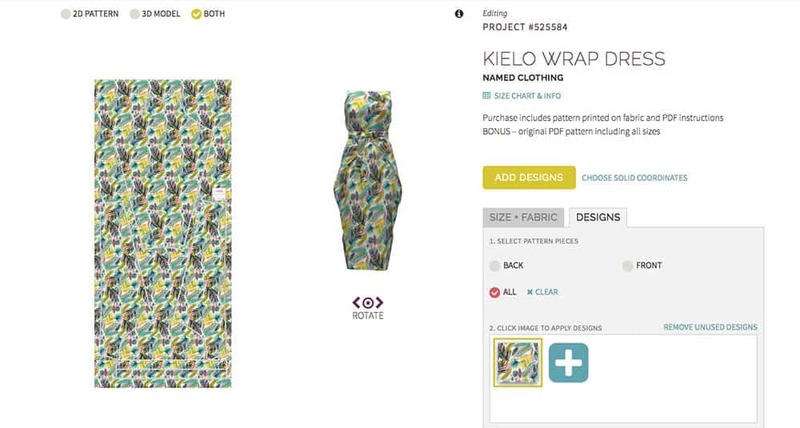 A 3D preview of my Kielo Wrap Dress turns this dress from an idea to a reality! The color coordinate tool is a great way to add solid color detail in your Sprout Patterns project. 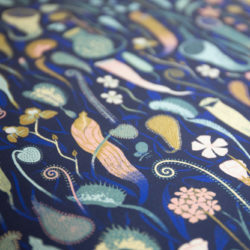 Seeing your Sprout Patterns project printed directly on fabric never gets old! Even though this might be my fourth Kielo (no shame here), I’ve never given Sprout’s solid coordinates tool a try. 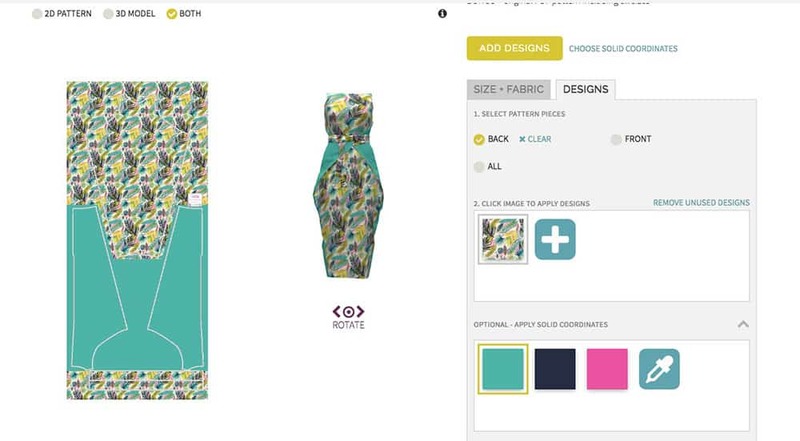 The color tool allows you to select solid colors from the Marketplace or custom design you’re using on your pattern. 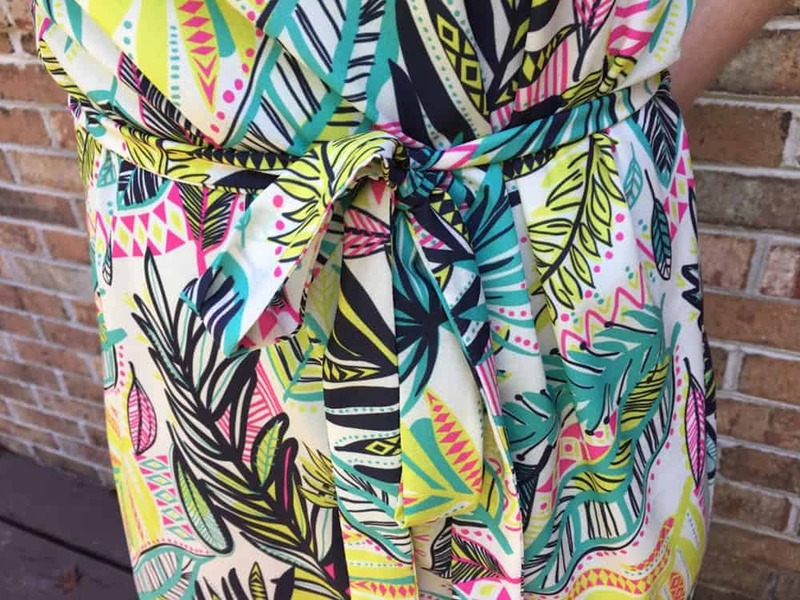 If you’ve ever wanted a dress with a bright pattern and coordinating solid color throughout, this is the tool for you! 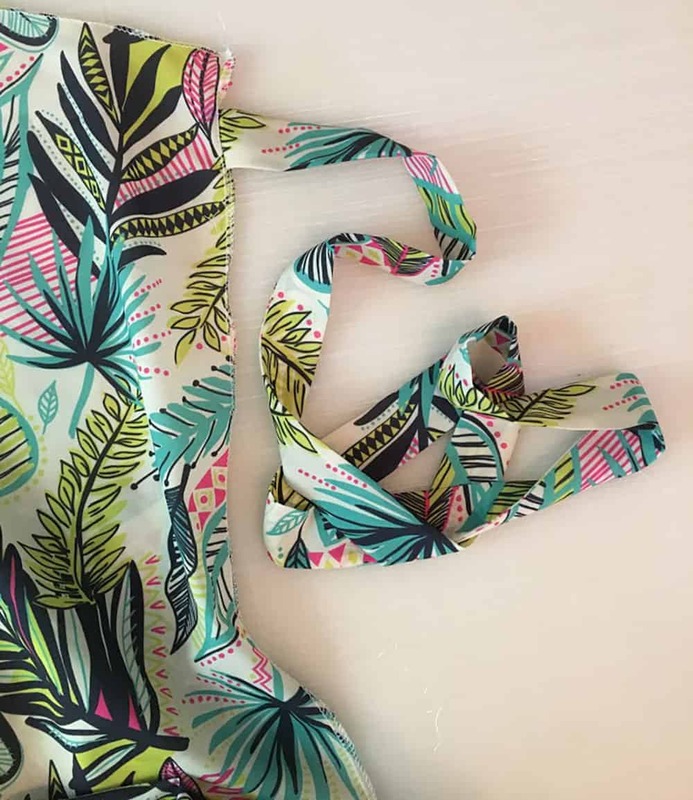 With the pattern printed directly on the fabric, cutting out Sprout pattern pieces is like spending the day at the beach! After cutting out the pattern pieces, don’t forget to mark any darts. After receiving my Kielo wrap dress, I washed the fabric and got right to work. With Sprout Patterns projects, all you have to do is cut along the outlined pattern. They’ve even included shrinkage and seam allowance into the cut-and-sew pattern! Your days of printing page after page of PDF pattern pieces are over. 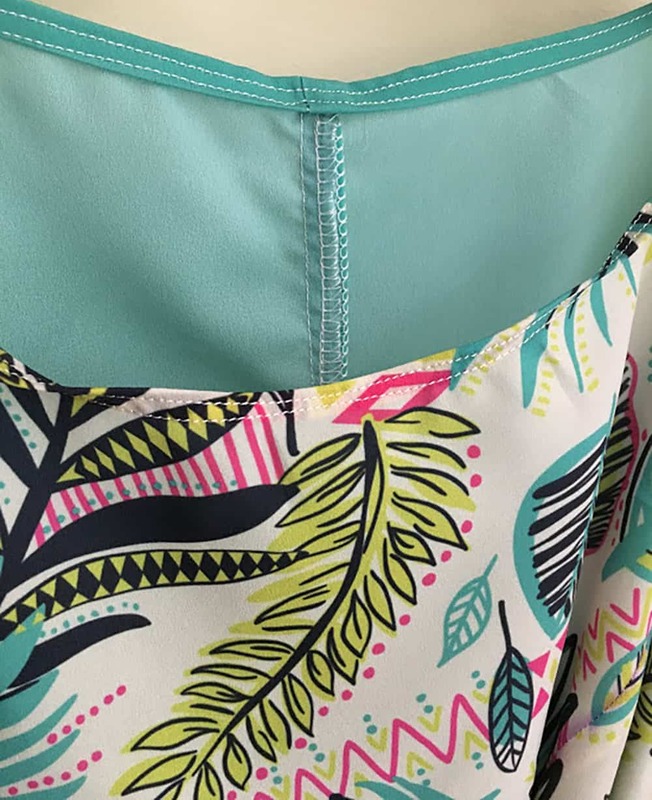 If your pattern does have darts, all you have to do is print the specific PDF pattern page (most Sprout Patterns projects include the full PDF pattern as allowed by the pattern designer) and trace them on to your pattern. 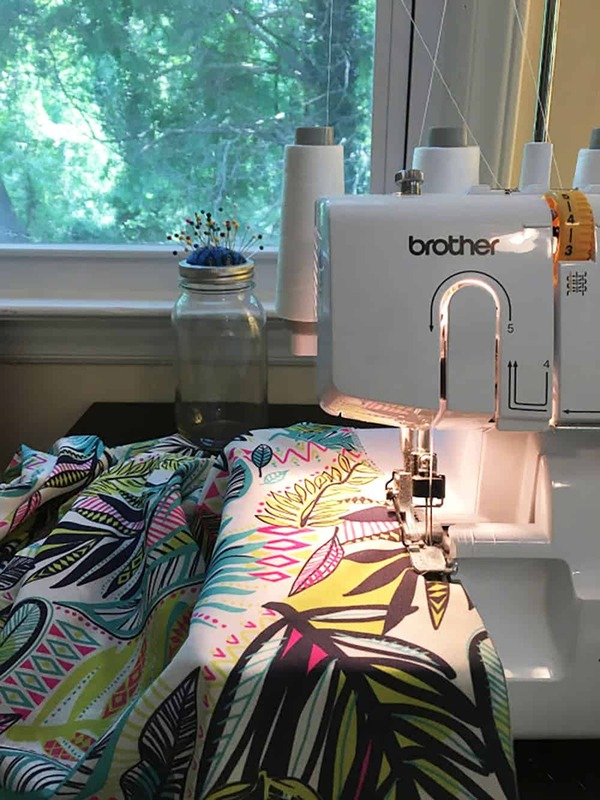 Before sewing together your pieces, finish your raw edges with a serger or zig zag stitch. I would consider my sewing skills to be beginner-intermediate. I feel confident sewing darts, zippers and have started my adventure of a me-made wardrobe. I’m less confident when it comes to neckbands and finishing arm holes, but I’m hoping that by my tenth Kielo I’ll have that mastered! It’s been a really fun process to compare my very first Kielo wrap dress to the one I made for the conference. Did you know when a pattern calls to finish your edges before constructing the dress, it means you shouldn’t have raw seams? As I’m sure you can probably guess, I didn’t know that, which meant my first dress frayed during wash. It’s still wearable but all other versions have beautiful serged edges. Even if I still struggle with neckbands today, I know I’ll get there! 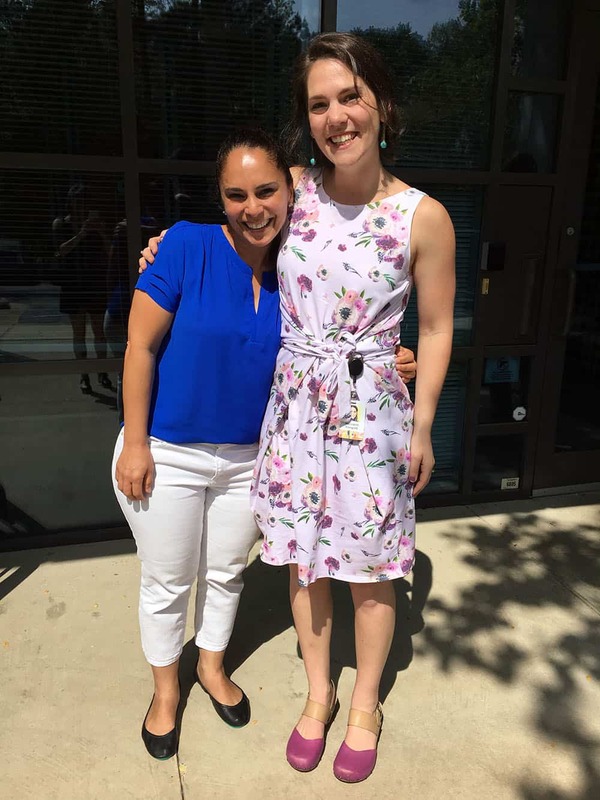 A special visitor to the Spoonflower factory calls for a Cotton Spandex Jersey Kielo Wrap Dress! Floral print by shopcabin – that’s the designer (Judy) on my left! One of my favorite things about the Kielo is the versatility. The dress is printed as floor length but I knew that might not be the most sensible for a conference where I’ll be walking around all day. I was able to easily shorten the length and in the past, have trimmed the neckline so it was slightly lower. My third dress was made from Cotton Spandex Jersey while the three other versions have been made in Poly Crepe de Chine. By simply switching up the fabric, pattern design, or incorporating the coordinate tool, this dress shows off a whole new personality! 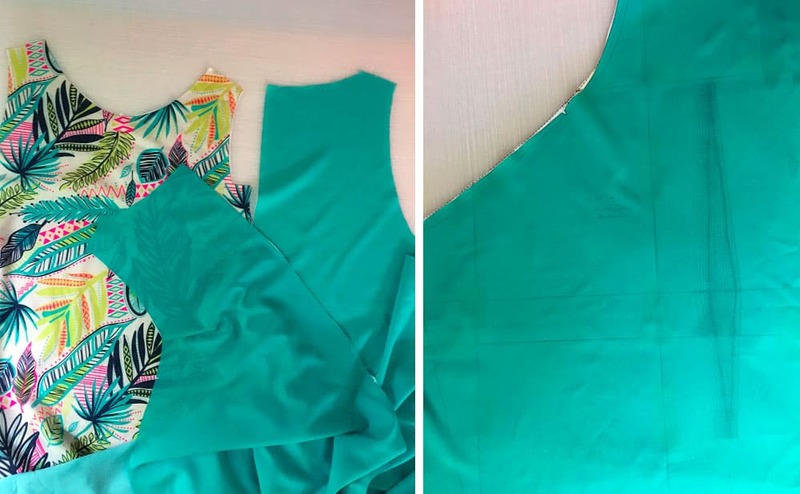 Just by wrapping the dress from the front first, you create a new look to the dress! Need a little help finding the perfect design for your next (or first!) Sprout Patterns project? Take a look at our curated themes for a head start. Let us know what your go-to pattern is in the comments. We’d love to add some to our list! Thanks, Magenta! I’ll have to make a Kielo in one of your designs! Great post Meredith! Love the design patterns and versatility of the dress. Thanks for sharing! I’m glad to hear you enjoyed it, Ann! 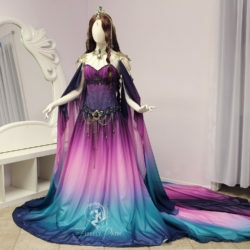 What a great dress. 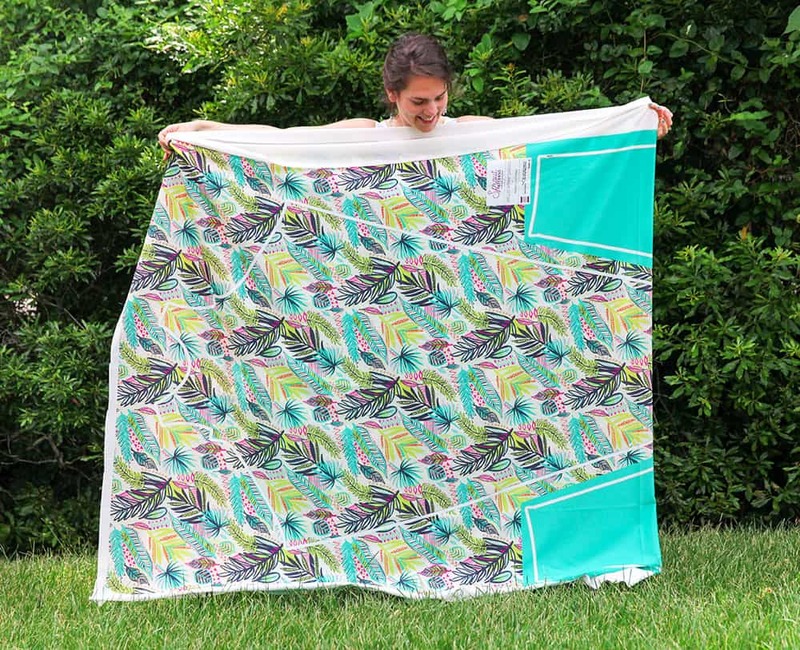 I love the warmth, the joy, and the creativity in all of the Spoonflower posts. Tutorials like this are helpful and clear. The projects are wonderful and useful, and I am always left inspired. I am so grateful that Spoonflower exists! What a joyful and creative community to be a part of. Thank you. Thanks so much for the kind words, Fran!